Designed to alleviate pain and discomfort caused by shin splints or muscle strains in the calf/shin area. Made with high quality neoprene and extra-strength fastening material to ensure a comfortable fit. EFFECTIVE CALF AND SHIN SUPPORT: Reducing soreness, inflammation and cramping, the Vive calf brace effectively supports weak or injured calf muscles. Providing great support for athletics, exercise and everyday use, the calf brace helps to prevent re-injury and promotes healing. 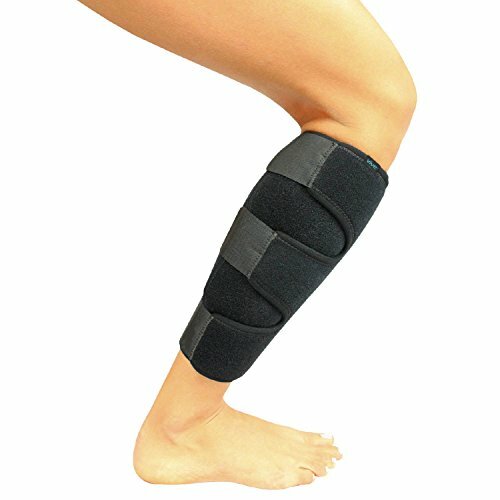 Use the adjustable brace for calf strains and sprains, shin splints, and varicose veins. MINIMIZES SHIN SPLINT SYMPTOMS: Retaining therapeutic heat and supplying gentle compression, the calf support wrap increases circulation to promote healing and reduce muscle soreness and inflammation. ERGONOMIC NONSLIP DESIGN: Ergonomically designed for maximum effectiveness, the contoured calf brace easily adjusts for a customized fit. The finished edges prevent the brace from slipping, rolling or bunching for a comfortable experience. VERSATILE AND LIGHTWEIGHT: Constructed with a breathable neoprene material, the brace stays cool and comfortable throughout the day. Three adjustable straps are secured with strong fastening materials for a personalized fit, accommodating most calf sizes. The versatile calf brace can be worn on the left or right calf.